First up, long-time Queens resident, Aimee. I met Aimee back in 2013 the first time I tried a class at Art of Fitness. I had decided to try Cirque fitness with no background in circus arts and not much upper body strength, either. Immediately, I was welcomed by friendly faces and felt comfortable right away. 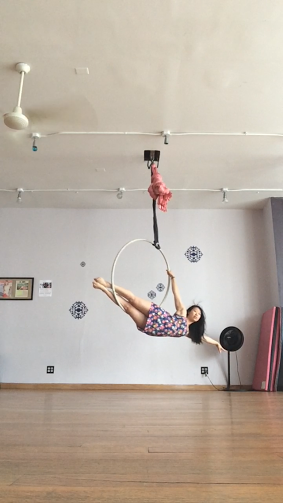 When we got to work on the silks, Aimee was nice enough to come over to me at one point where I was spinning around uncontrollably (very slowly though, mind you). I saw her at more classes over time, and she taught Cardio Ballet Blast, which is one of my favorites. How long have you lived in Queens? I went to college in Manhattan at Fordham Lincoln Center and was looking for an affordable, safe neighborhood to move to off campus. Astoria more than fit the bill! When did you discover Art of Fitness? I discovered the Art of Fitness in 2011 through Groupon! I saw that the studio offered aerial silks and when I realized how close it was, I immediately signed up for cirque fitness class. I was terrible and couldn’t do anything in the class (no upper body or core strength at all! ), but it was so much fun and I was determined to learn more and keep at it. Four years later, and here we are! What is it about Art of Fitness that’s enabled it to grow and thrive over the years? I would say it’s the sense of community and accepting, non-judgmental class vibe. All of our classes are dance-based, but they’re definitely fitness classes, so no one is judging you on whether you have a perfect turnout or plie, everyone is there to just work out and have fun! Our classes attract people of all ages, shapes, and sizes, and guys are welcome too, even though the majority of our students are women. The studio is small and intimate, so it is easy to get to know your fellow classmates. I’ve made some really great friends through the studio myself, and it’s easy to pop over to brunch or dinner after classes to hang out since the studio is in such a central location to so many great restaurants. I think people are drawn to the studio for our unique class offerings, and stick around for the community of awesome people that we’ve been lucky enough to attract. 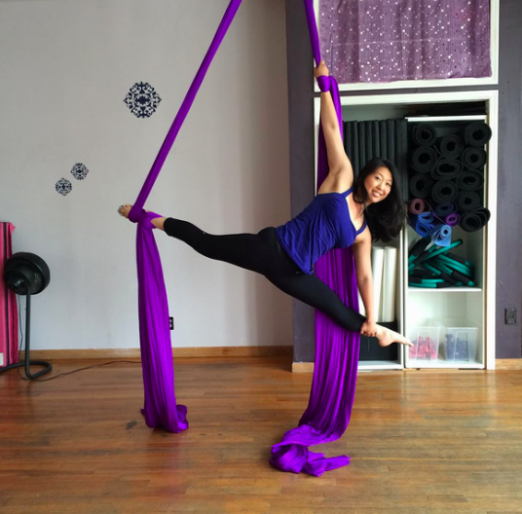 Cirque is very popular, and our Zumba and pilates mat classes have good turnouts as well. I’m at the studio pretty much every day, and I’m fortunate that I live a short walk away, so I’ll grab food on the way to the studio or in between classes at Brooklyn Bagel or a juice at Greenbay Marketplace. The Art of Fitness! We are steps from the Steinway Street station but since we are on the third floor of our building, we don’t have a lot of street visibility, so new students often tell us that they’ve lived in Astoria for so-and-so years and never knew we were here. But aside from that, I think the Newtown Road Backyard Film Festival is a hidden treasure! Frank (who I met through the studio!) has been getting a lot more publicity but when I started going a few years ago, I felt like I discovered something really special. Also, the Astoria Park pool! I had been to the park’s track many times and never knew there was a beautiful Olympic-sized swimming pool right there! Sweet Afton, Sekend Sun, and Sparrow! For cultural/visual activities, I love bringing people to Socrates Park, the Noguchi museum, and the Museum of the Moving Image. For food, my go-tos are The Queens Kickshaw, Bareburger, Enthaice or Pye Boat Noodle (I have a serious Thai food obsession). I love that it has become such a foodie destination! Living in Queens used to be considered uncool, but now it’s one of the “hot” places to live, especially Astoria. It’s always been a place for young creative people, and I think other people are finally catching on.